July 31, 2011 - Avfuel-branded Monterey Jet Center at Monterey Peninsula Airport (KMRY) will once again play host to Gordon McCall’s Motorworks Revival, the private kick-off party for Monterey Auto Week beginning August 17. 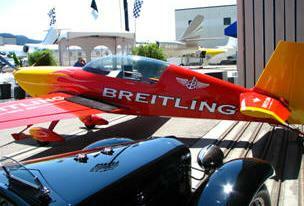 This is the twelfth year that McCall has held the exclusive event at the Monterey Jet Center facility. Hosted by McCall Events, Inc., a marketing and public relations company specializing in exclusive VIP events and led by well-known automotive aficionado Gordon McCall, the Gordon McCall Motorworks Revival entertains more than 2500 guests amongst private jets, vintage cars and gourmet food and wine in Monterey Jet Center’s state-of-the-art hangars. “Monterey Auto Week and the subsequent events – such as the Concours d’Elegance, the Pebble Beach RetroAuto, and the McCall Motorworks Revival – definitely make late August one of the busiest – if not the busiest – times of year for us,” said Nate Young, Monterey Jet Center’s General Manager. The centerpiece event of Auto Week, the Concours d’Elegance, is considered one of the world’s premier celebrations of the automobile. Rare and collectible cars are invited to assemble on the famed 18th fairway of the Pebble Beach Golf Links. The annual affair, first conducted in 1950, has raised over $14 million for charity. The event brings in automobile collectors and enthusiasts from all over the world, many of them flying in on private planes, meaning an uptick in business for FBOs such as Monterey Jet Center. Avfuel provides fuel and services to the global aviation industry and is the leading independent supplier in the United States. Established as a supply and logistic company nearly 40 years ago, Avfuel is core competent in every aspect that surround the delivery of fuel – from refinery to wingtip.